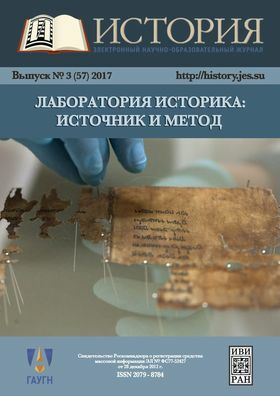 The present issue of the Journal of Education and Science “ISTORIYA” consists of papers dedicated to various aspects of the history of the Antiquity, the Middle Ages, and the Modern Time, including problems of archaeology, numismatics, source studies, historiography. Some of the papers are concerned with the history of law, the mutual perceptions of countries and peoples, propaganda, religion and religious minorities, study of pieces of art as historical sources. About a half of the articles included into the issue are upgraded versions of papers presented in the conference “Laboratory of Historian: Source and Method” which was held in Moscow on the 23rd — 24th of November, 2016.